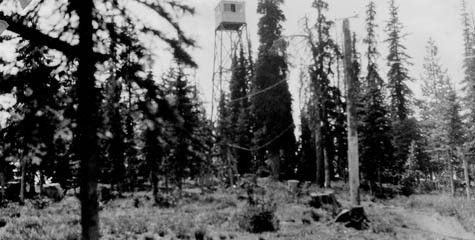 Search the photo archives – assembled and maintained by Rex Kamstra, complete with lookout tower trivia – from Oregon and Washington to the hills of South Dakota (or just check out the site's newsfeed) to explore these often extraordinarily remote structures in all their minimalist – and historically fascinating – glory. 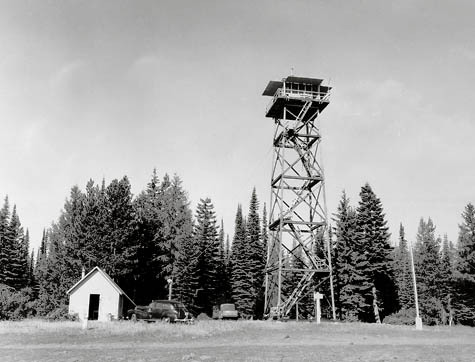 While you're at it, don't miss the U.S. Forest Service's own catalog of these overlooked minor building types: fire lookout towers in Sequoia National Forest, for instance, and Umatilla. The fact that there are any lookout towers still standing at all is, it seems, slightly amazing. 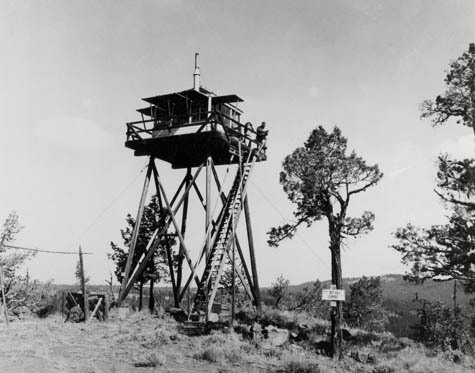 "In their heyday during the 1930s," the Forest Service explains, "there were over 8,000 fire lookouts that dotted mountain tops across the United States with over 600 in California. Today there are only a few hundred in operation. 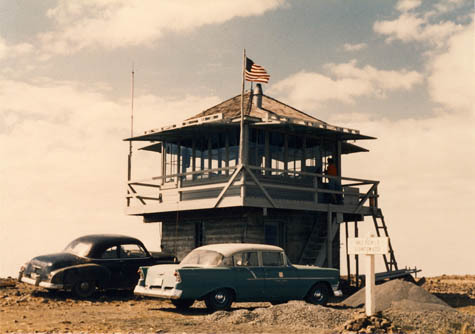 Once considered a proud symbol of our nation's conservation heritage, fire lookouts are a fading legacy. 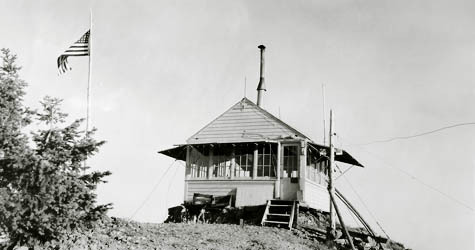 There are 10 lookouts left on the Sequoia National Forest." Instead of a definitive reference work, there are simply books (albeit still fascinating) like How to Rent a Fire Lookout in the Pacific Northwest: A Guide to Renting Fire Lookouts, Guard Stations, Ranger Cabins, Warming Shelters and Bunkhouses in the National Forests of Oregon and Washington; Adirondack Fire Towers: Their History and Lore; Lookouts: Firewatchers of the Cascades and Olympics; and the so-called "fire lookout research" of David E. Lorenz (now out of print). So people are clearly still interested in these structures. For instance, check out this photo-log of a hike up to the spectacular mountain views of the Mule Peak Lookout. More architecturally, the Skagit River Journal also gets into the ways and means of these towers' construction: "Before mountain roads were built of a size to accomodate trucks, the materials were largely packed in on backs or on mules, and then another team had to slog through the brush, stringing telephone wire before the use of two-way radios." Thus were distant structures assembled in the woods. Plus, where, now, are the people who actually lived in these structures – stationed there for whole seasons at a time to eat canned peaches and watch the stars, looking out for signs of distant fires? Are they still alive, and, like Maxine Meyers, could you interview them? 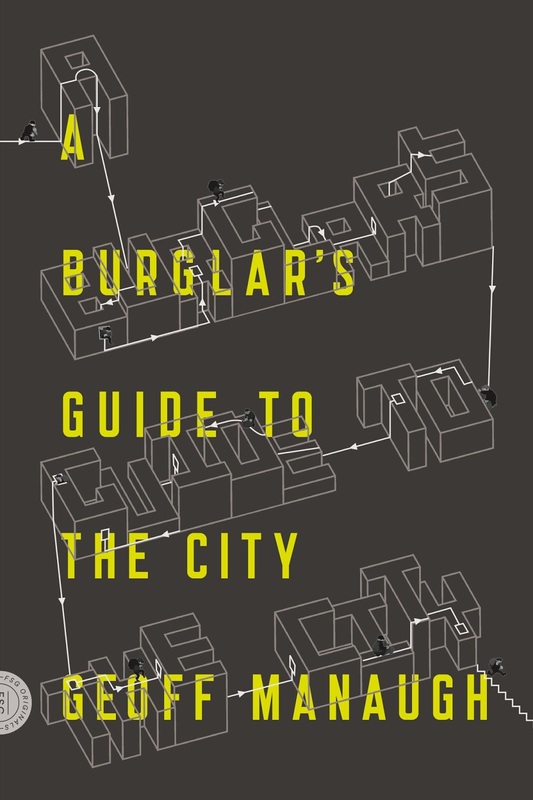 It's an architectural form that comes with its own anthropology: narratives of use and inhabitation. Further, who designed these structures – based on what plan, and from what material inspiration? 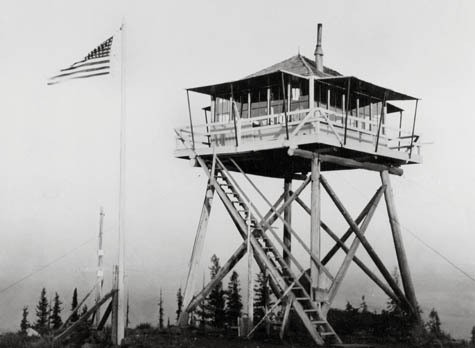 What would a fire lookout tower, built today, look like? 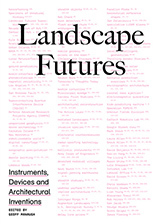 Perhaps like the awesome "Prairie Ladder" by Anderson Anderson? These towers, after all, aren't just towers; they have a kind of optical functionality, built specifically for the purpose of viewing the landscape in a certain, specific, highly regulated way. They spatially frame this act of disciplined surveillance. In a sense, they are like the British watchtowers so beautifully photographed by Donovan Wylie. Yes I'd like to see a book on the architecture of lookout towers. In the meantime there is John Suiter's 'Poets on the Peaks'. which has some great atmospheric photographs. You can still experience many of these structures. I believe I first read about them in Outside Mag. There are several articles that describe the current use of them, often open to the public for dollars a night. NY Times Travel had a recent article and some beautiful pics at Tiny House Blog. This may, if only for a small portion, begin to answer where they fit into our current architectural history—Nostalgic structures whose purpose and significance can not be fully understood by many visitors. 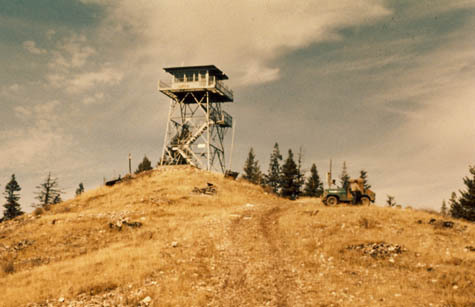 while courting my future (non-architect) wife we rented a fire tower in montana for a week. you couldn't ask for a more romantic structure. on the highest point of a mountain. completely open on all sides, yet completely private. 360d views for hundreds of miles. beds a bench and a kitchen, all reduced to the bare essentials. and the imminent possibility that it will be struck by lightning. 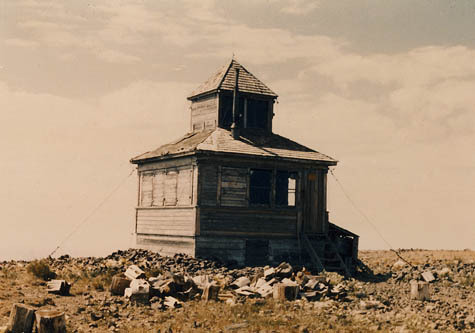 Fire lookout towers had a similar purpose but a less rural appearance in on some areas of the Northeastern U.S. There is a surviving structure in New York City that is one of the earliest exponents of cast iron architecture in the US. I was hiking in New Jersey and camped underneath a fire tower (the catfish fire tower on the AT in case anyone has been there). There were no trucks around and littly more than a half-eaten sandwich to suggest anyone was there but even still the entire time I couldn't help but think some bored lonely soul was staring down watching me the entire time. It was a perfect panopticon. anyway, I am currently driving around the US and could think of no better person to suggest interesting stops and things to see along the way. Is there anything vast, sublime, or interesting it would be a shame to miss? I remember you mentioning at some point the wind cave, or the giant government pyramid, etc. 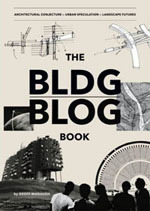 An evolving architectural typology. At the Tillamook Forest Center in Oregon the lookout is part interpretive, part functional and part icon. Considering the Beat link, and their collective Japan fixation, I am especially intrigued at the similarities between some of these fire lookouts and the recent tree-house tea-houses designed by Terunobu Fujimori. Just a coincidence perhaps! I believe there are some in the Adirondacks, as well. Perhaps on Gore Mountain (??). It's been a while since I've gone skiing there, so maybe there is no longer a tower there. I grew up near one of these towers in Northern California. It was amazing. I loved to climb it and look around. It was a great place to show friends and go clear your head. Thanks for reminding me. I might seek one out here in SoCal. My memory could be off but I believe that Steven Holl has a minor obsession with fire lookout towers. I can't find a link but I feel like he contributed to a small volume on these towers or there exists a volume that he referenced and it's buried in some architecture library in the timber construction stacks. These are wonderful structures I have the pleasure of maintaining the solar electrical system and communications systems in one of these towers in Redwood National Park here in CA. I always like to get up to the tower and admire the view. Its much better than the office walls. There was a great personal diary of somebody who worked in a fire lookout printed in an issue of the Paris Review last summer. You can read the start of it through that link but you need the print issue to get the whole thing. trees around Pemberton in southern Western Austraila.